Vega Base (Acacia Gum, Fruit Juice Concentrates (Aronia, Apple, Elderberry, Blueberry & Blackcurrant)), Zinc Citrate, Vegetable Capsule Shell (Hydoxypropyl Methylcellulose, Colours (Titanium Dioxide, Copper Chlorophyllin)), Anti-caking Agent (Magnesium Stearate). 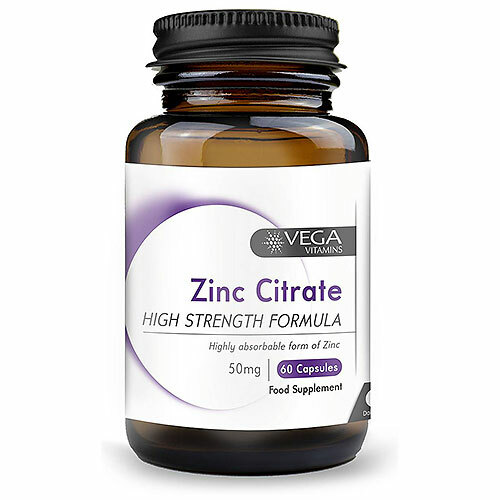 Below are reviews of Vega Vitamins Zinc Citrate - 60 x 50mg Capsules by bodykind customers. If you have tried this product we'd love to hear what you think so please leave a review.